Erosion Control - Krumholz Brothers Landscaping, Inc.
Whatever your erosion problems may be, you can trust Krumholz Brothers Landscaping, Inc. to meet those needs to your complete satisfaction, with results that only a knowledgeable and experienced crew can provide. What’s sneaky, hard to catch, and eats away at your property? Erosion. The slow but sure destruction of land, though rain, wind, and other weather elements that keep wearing away at soil. On downward slopes, water loosens the ground and drags it off, disturbing the landscape and destabilizing foundations. It’s like a thief is stealing your soil and depositing it elsewhere. How can you prevent or stop the devastating effects of erosion? Through erosion control methods like increased vegetation (perennials, shrubs, deep rooted plants), windbreaks, terracing, cross paths, rocks and boulders, drainage systems, retaining walls (see our webpage devoted to this topic), and rainwater runoff management. 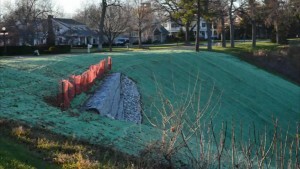 If you have an erosion problem, or suspect that you do, you need to solve this problem quickly. Krumholz Brothers Landscaping, Inc. has the tools and expertise you need to stop erosion and prevent it from destroying your property.